I realize it might be a little hard to see what’s happening in the pic above, it looks like it was taken by a Justin Beiber paparazzi with one of those old Polaroid Land cameras and a flash cube while riding on a moped through downtown Rome. 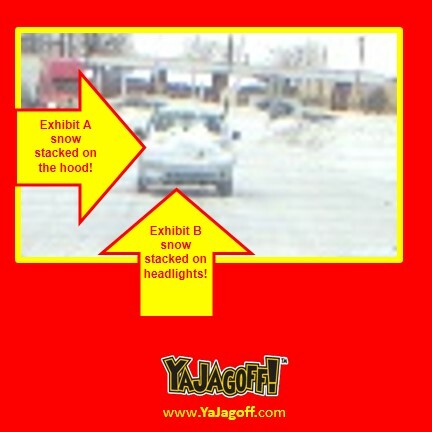 The Jagoff-estrator, however, points out what you’re seeing… a car driving down the road in a snow storm with snow piled up on the hood almost to the driver’s eyeballs. And, I guess in their hurry to ALMOST clean off the car, I guess they forgot to clean off the headlights… or even TURN THEM ON!!! At first, I took a second look… I thought I was seeing one of those Hot Wheels cars with the engine sticking out of the hood… and.. of course.. covered in snow. FYI.. it’s a bad thing to have to stack phone books on your driver seat so that you can see over the dashboard…it’s even worse to have to stack milk crates on your driver seat so that you can see over the snow that your were too lazy to clean off of your hood, Ya Jagoff!! That Power Ball Joker At Work!!!! !